In the past, concrete was used merely as a base material because it dried to a grey-brown color that is not necessarily aesthetic. That is not the case anymore, thanks to concrete staining. As a premier decorative concrete company, Dallas Concrete Artisans has been using concrete stains in enhancing plain concrete surfaces for over 20 years. Every result was impressive so it just follows that every customer was more than satisfied. Concrete Staining is one method of transforming plain concrete into something more decorative. Paint can add color too but it didn’t look as stunning and it didn’t last very long. 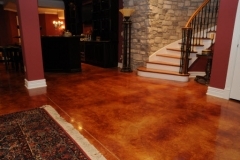 Acid Stain – This type of concrete stain is a reactive type. This means it triggers a chemical reaction once the metallic salts it contains comes in contact with the hydrated lime in concrete. The effect is quite dramatic, causing shades of color and patterns to appear. Acid stains penetrate deep into the concrete slab so it won’t peel or fade. The stain dried into a translucent color that varies in intensity and pattern. 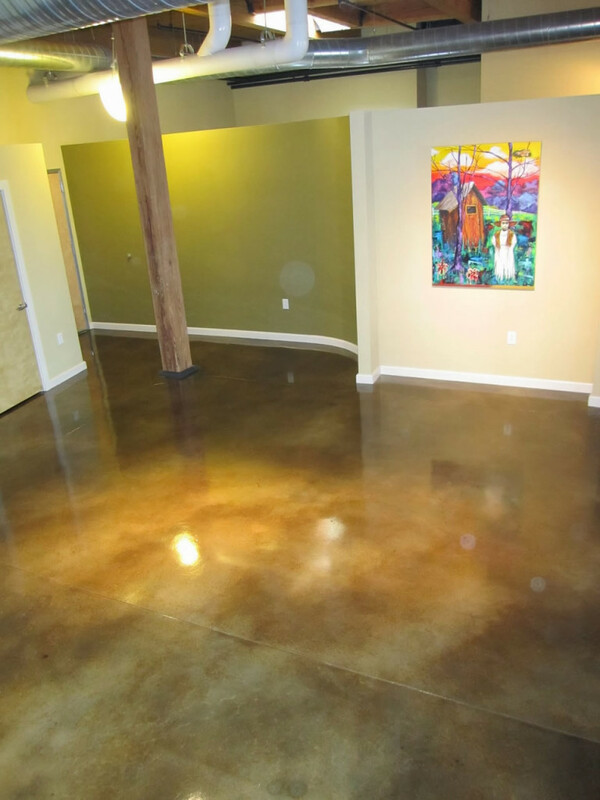 No two acid stained concrete floors are alike. Water-based Stain – This non-reactive stain dries in the exact same color it was before application. Because it does not contain any metallic salt, the colors are more consistent. This comes in a wider range of colors, each one drying to an opaque finish. This type of stain is ideal for projects that call for specific designs, patterns, graphic images, and the like. Color Options – Acid stains come in earth and blue-green tones while water-based come in almost a full spectrum of colors. Concrete dye, integral color, and dry-shake color hardeners come in similar colors. UV Resistance – Concrete stains can be used on both indoor and outdoor surfaces. Only a few brands of concrete dyes can be used outdoors. Most are sensitive to UV rays. 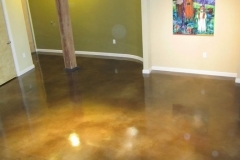 New & Old Concrete Use – Concrete stains can be used on both old and newly poured concrete. 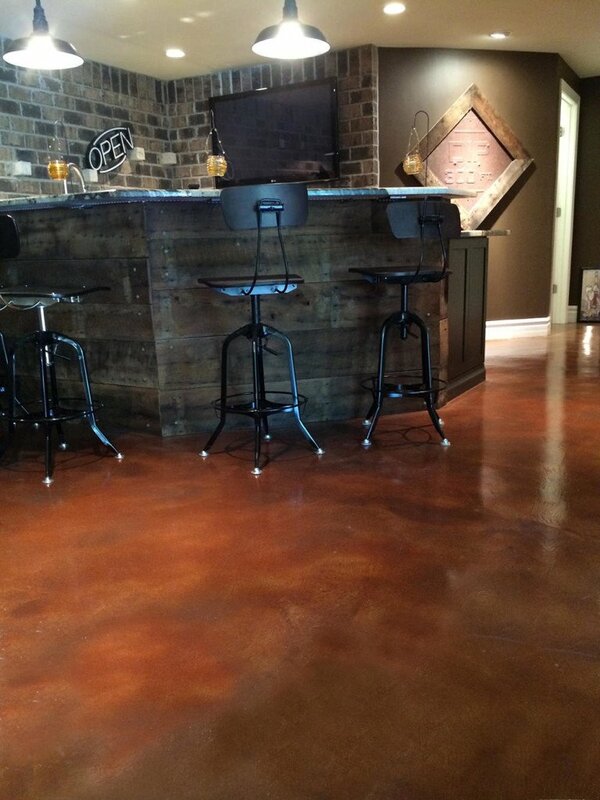 The only difference is that new concrete must cure for 28 days before the stain can be applied. Integral color and dry-shake color hardener can only be used on new concrete surfaces. 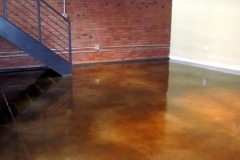 Versatility – Concrete stains can be used as an add-on for concrete overlays or coatings. Integral color can only be used on a new concrete slab. 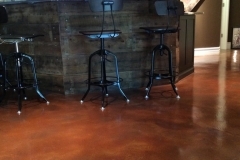 Basic Stain – This includes zero to minimal floor preparation, one stain color, and a coat of concrete sealer. 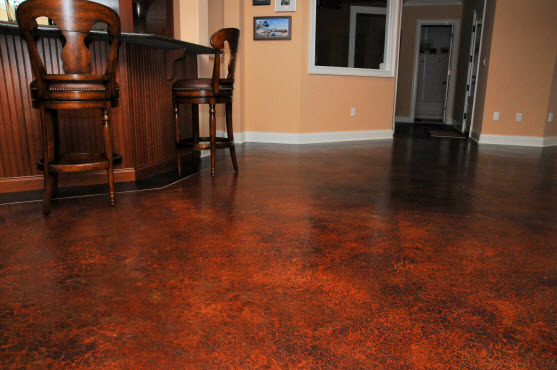 Intermediate Stain – This includes minimal surface preparation, one stain color, and a final coat of concrete sealer. Upgraded Stain – Aside from surface preparation and sealing, this also includes complex patterns and multiple colors. High-end Stain – In addition to slab preparation and sealing, this also includes hand-applied stains and custom stencil work. Our staff can give you a thorough concrete surface assessment and an accurate quote, free of charge. Step 1: Prepare the surface of the concrete space that needs staining. This may involve some minor repairs and cleaning. 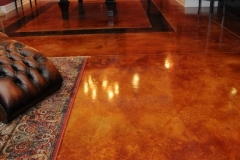 For floors that have an existing sealer or coating, grinding the surface can help make the new stain adhere properly. Step 2: The stain is applied onto the concrete surface using a brush, mop, or spray gun. Make sure that surrounding areas are masked prior to spraying. Step 3: If the color seems dull after the first coat, you may add another layer of the same color. You may also use a different color if you want a more interesting shade. Step 4: Once the stain has dried, rinse the surface until runoff is clear. For acid stains, it is important to dispose of the rinse water properly as it may contain some acidic residue. 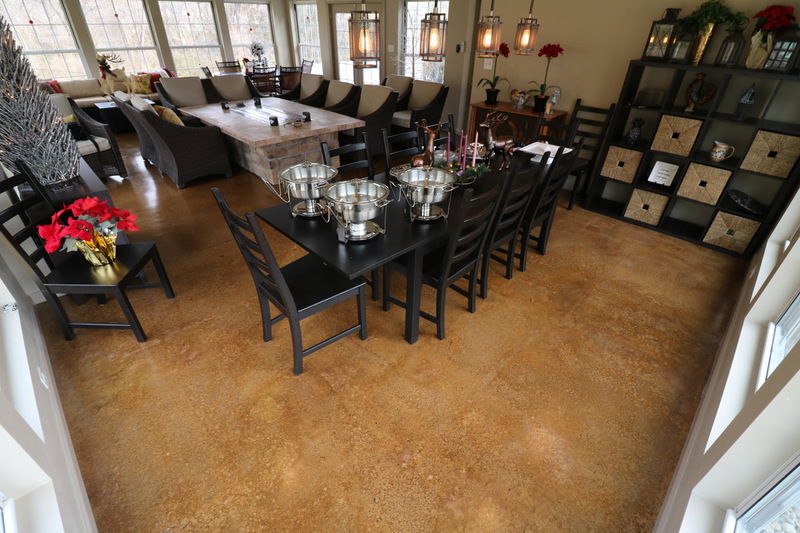 Step 5: A concrete sealer needs to be applied to protect the concrete floor from damage, lengthen the lifespan of the stain, and to give the concrete surface a luxurious shine. Breathe new life to your concrete spaces. 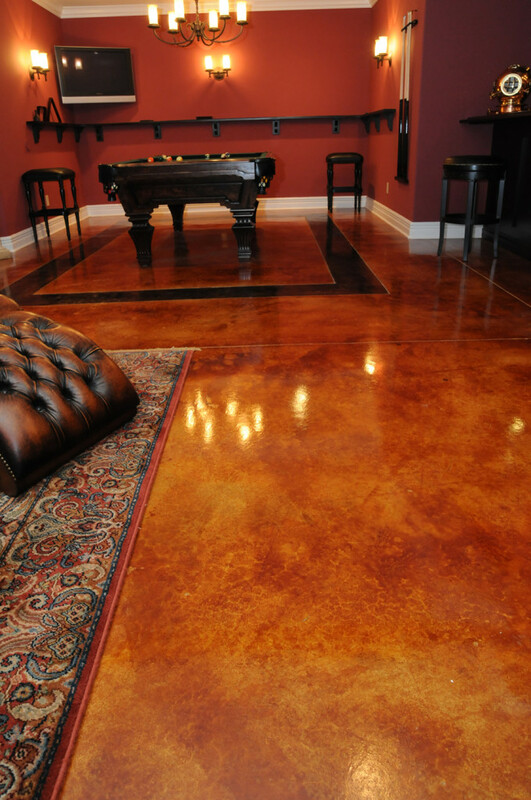 Call (702) 389-9442 for expert staining concrete services. When it comes to enhancing exterior and interior floors in Dallas, nothing does concrete staining better than our decorative concrete team. Dallas Concrete Artisans has years of experience in the industry, use only the highest quality products, pay very close attention to detail and take pride in our work. In addition, all of our work comes with a warranty. 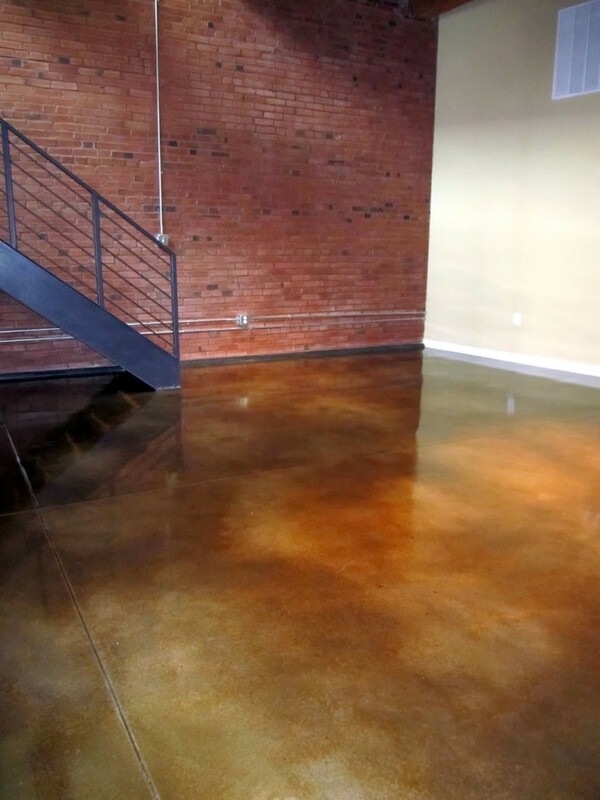 Have a stained concrete project in mind? Need some pool deck, driveway or concrete patio ideas? We are just a call and an email away. We would love to hear about it and provide you with a free in-home consultation and price quote.